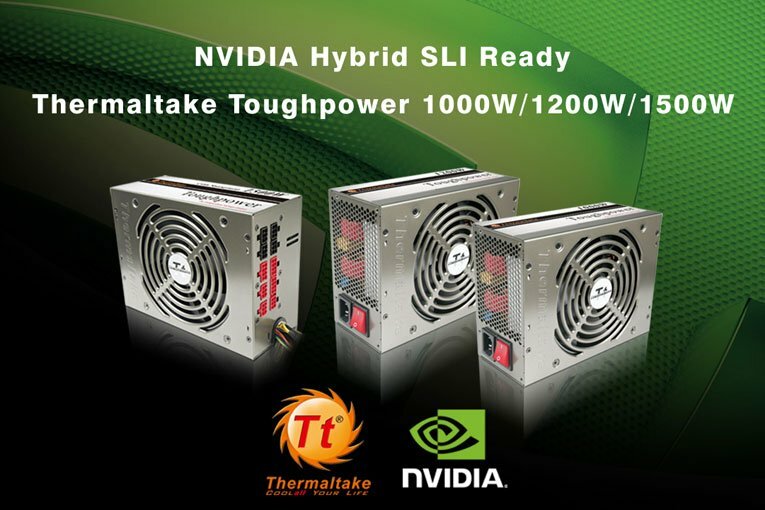 July, 2008 – Thermaltake Technology announces today, its top of the line PSU, Toughpower 1000W / 1200W / 1500W, have been certified by NVIDIA as NVIDIA Hybrid SLI ready PSU. Toughpower 1000W / 1200W / 1500W is one of the few power supplies that can be certified by NVIDIA Hybrid SLI technology for three GeForce GTX 280 / 260 GPUs and two GeForce GTX 280 / 260 GPUs. Innovation in the graphics technology is unbelievably rapid. Not long after the introduction of SLI technology, NVIDIA recently unveiled the Hybrid SLI technology for all the enthusiasts. NVIDIA’s new Hybrid SLI technology combines NVIDIA’s motherboard GPU with discrete GPU (on graphics cards) to deliver multi-GPU benefits. To bring the cutting-edge product to users, Thermaltake’s Toughpower 1000W / 1200W / 1500W is designed to support all the latest technologies. Toughpower 1000W / 1200W is equipped with three 6pin PCI-E connectors and three 8pin PCI-E connectors. Moreover, Toughpower 1500W even comes with four 6pin PCI-E connectors and four 8pin PCI-E connectors, making it the best choice for all the latest graphics technology. Toughpower 1000W / 1200W / 1500W all possesses four independent +12V rails, stable voltage (±3%), 14cm dual ball bearing fan, and a high efficiency of over 85%. For NVIDIA Hybrid SLI compliance, Toughpower 1200W / 1500W can supports the highest application of up to three GeForce GTX 280 / 260 GPUs; and Toughpower 1000W can also supports up to three GeForce GTX 260 GPUs and two GeForce GTX 280 GPUs. With the latest technology enabled, Thermaltake Toughpower is no doubt the essential part of a high end gaming system.